Here is Johanna Drucker’s piece, “Humanities Approaches to Graphical Display,” that I mentioned in class. In her abstract, Drucker argues that ” the concept of data as a given has to be rethought through a humanistic lens and characterized as capta, taken and constructed.” In doing so, I feel that she helps to establish what is unique about humanities computing–that it is not computer science and humanistic study on different sides of the same coin, but rather an integration of concepts from both disciplines. This entry was posted in Fall 2014, Resources & Links of Interest and tagged capta, Data, Drucker, Humanities, What is DH on September 12, 2014 by Mary Catherine Kinniburgh. Note to future twitter readers: start from the bottom & work your way up. I’m having a really good week on Twitter (and not just because I have 30 or so new, wonderful followers from our DH praxis class, though that certainly helps). Look at that: FIVE favorites, ONE re-tweet, and the re-tweet came from an Open Access related association/company/group that I don’t even know! Of course I followed them back. The problem with Twitter, and specifically the tweets shown above, is that they’re difficult to document (or read) after the fact. These two in particular happened in succession as part of a conversation between me, myself, and the Wall Street Journal. They will live forever on the Internet, backwards. As a person that prides herself on subtle jokes and one-liners I find this deeply troubling. Should I have tweeted backwards for the benefit of future readers, but to the disservice of active twitter users? What if some high ranking administrator at my institution sees my Tweet and doesn’t get it? Should I make my Twitter private? What’s really the point of Twitter, then? Should I have hyperlinked the article in question? What if it had been behind a pay-wall? The Library of Congress has begun archiving tweets, so I am inclined to believe that the present conversation is not what matters but rather the conversation’s future impact. Despite my better-than-average week on twitter – combining popular media with my profession in a concise-less-than-140-character package – I’m not sure if who actually matters actually cares. Academia is beginning to care. I think. Emerging products such as Altmetric (and specifically I’m talking about Altmetric the product from Digital Science, not altmetrics the concept) enables researchers and scholars to quickly see the active conversations happening around article-level content. Such information happens in real-time, just as twitter intended. This function is contrary to both the current rate of publishing – super, super slow – and well curated article citations that have historically defined academic conversations. The traditional academic conversation has seen criticism of late, with the emergence of peer review scams and bogus scientific articles, which to me indicates a serious flaw in the publishing process, available resources, and the resulting competitive nature of academia. Despite the emergence of such concepts and products that may very well be helping to subvert the traditional process I am brought back to Matthew G. Kirschenbaum’s reference in regards to academia and the Silicon Valley. With my altmetrics/Altmetrics example, the concept emerged as a possible solution to collect and display scholarly conversations, but the product (capital “A”) has been monetized. In my daily work – I’m the E-Resources Librarian at Queens College – I receive cold-calls (industry term: “Inside sales”) on a schedule: at the end of each quarter, so that representatives can make their numbers and receive bonuses (for speed boats, etc.). Library vendors (publishers, mostly) want to sell me stuff, and yes, I’m very disillusioned about it. Before joining the ranks of faculty librarianship I worked for a vendor and I know well what’s happening behind-the-scenes before I’m called. So how does this relate to DH? I’m not convinced that citing social media and related sources are DH. I do think that DHers, or those inclined to accept it as a discipline and perhaps learn and use its methods, are more likely to follow along via such outlets. I’m also curious about the monetary aspects of DH. When I join the ranks of those that can claim DH scholarship and practice, will I have to add names to my digital rolodex of “reps to dodge lest they try to sell me something”? 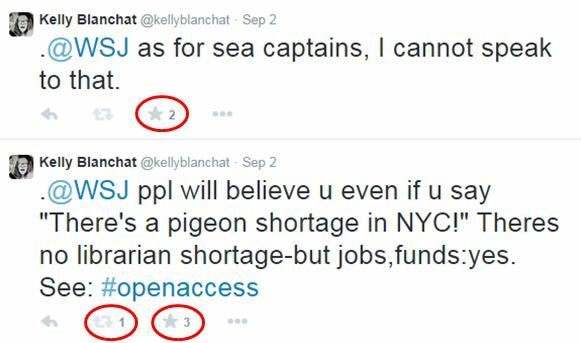 This entry was posted in Uncategorized and tagged academia, Kirschenbaum, Libraries, Publishing, Scholarship, Social Media, Twitter, What is DH on September 10, 2014 by Kelly Marie Blanchat.